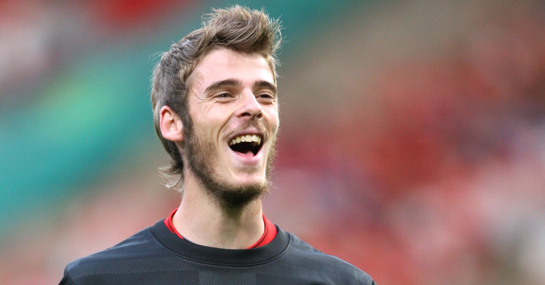 In all fairness to David De Gea, the first goal the Spanish U21 side conceded in their 7-2 rout of Georgia is not his fault. It is however, one of the greatest own goals in history as Real Sociedad defender Inigo Martinez scores with an audacious backheel from 30 yards that loops over De Gea’s head. Watch the clip above, supplied by YouTube, and make up your own mind but there isn’t too much communication between De Gea and his two central defenders and while Spain were 6-0 up at the time, that would worry Sir Alex Ferguson. There’s nothing De Gea can do about Martinez deciding to flick a leg out at a ball that has gone past him and Manchester United fans shouldn’t worry too much, but the fact De Gea has made headlines again will not be great for his confidence. The Spanish U21 side host Georgia in the return leg tonight and De Gea will be hoping for a quieter night as the Spanish youngsters look to consolidate their place at the top of the Group 5 table in the qualification process for the 2013 European U-21 Championship in Israel. Spain are 1/33 to beat Georgia tonight and the bookies are confident Georgia are in for a pasting once again. Incredibly, Spain are as short as 6/1 to win 6-0 while a 7-0 result is 10/1, 8-0 is 16/1, 9-0 is 25/1 and 10-0 is 33/1. Anybody that fancies Georgia reversing the form on Spanish soil tonight can back them at 25/1, but with the game being played just north of Madrid, it’s a case of how many will Spain score. The national side play Liechtenstein on Wednesday and victory would confirm their participation in the 2012 European Championship. Spain are 1/200 to beat Liechtenstein on Tuesday night so it’s safe to assume we’ll be seeing the Spanish in Poland and Ukraine, although punters can back Liechtenstein at 100/1 to upset the odds tomorrow.